The Awesome Library is an Internet library database developed by Dr. R. Jerry Adams, currently the Executive Director for the Evaluation and Development Institute, which co-owns the database. 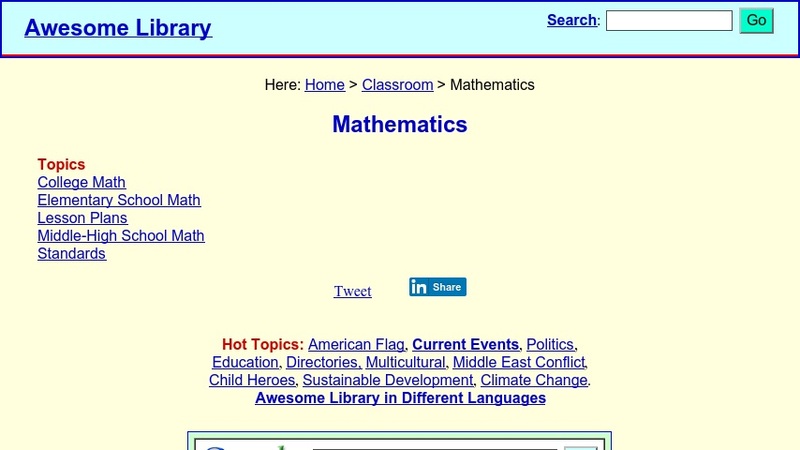 This section of the database is devoted to mathematics and provides links to math lessons and other Internet resources, such as games, worksheets, and articles. The database is organized first by grade level, such as elementary, middle school, or college, and then by sub-topics, such as Algebra, Geometry, or Calculus. A section on Standards offers links to reports and facts on mathematics standards used across the United States. The resources listed in this website "have been reviewed and found to be of high quality for our users" and the top 2 percent of the Awesome Library's resources are given a star, indicating that they met additional selection criteria, such as comprehensiveness or organizational quality. The database is also available to browse in Spanish, French, German, Russian, Dutch, Malay, Arabic, Greek, Indonesian, Italian, Portuguese, Chinese, Korean, or Japanese.